A specific shamanic initiation allowed governing elite or medicine men to communicate with nature deities. Banned by evangelic oppression as a satanic witchcraft, the shamanic ritual became a secret cult or disappeared. It was only briefly mentioned in indian chronicles, unwilling to draw attention of the powerful Inquisition. - the Vision Serpent embodied by the Feathered Serpent guide. 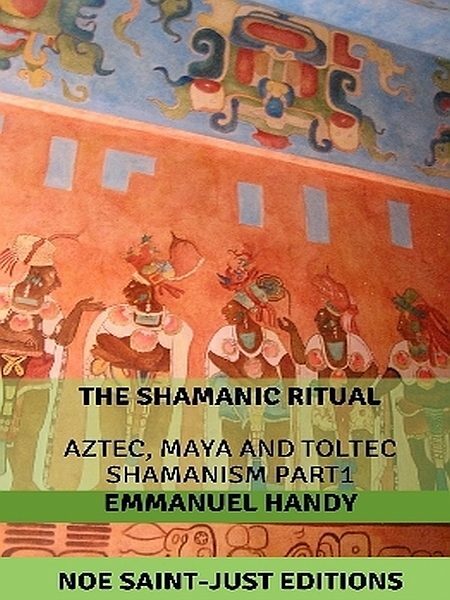 This series upon Aztec, Maya and Toltec shamanism aim to faithfully summarize the available literature and information about ancien prehispanic rituals rituals (in Mexico, Peru, Bolivia, Guatemala...). Contemporary testimonies of surviving shamanism in the Amazon rainforest will also help to understand old concepts. This second book of the series is devoted to the non-animal spirits appearing in pre-Columbian art (sculpture or paintings). These supernatural spirits also depends on plants consumed, and on his own animal-Guardian Spirit. On maya bas-reliefs, governors are sometimes depicted facing a supernatural monster head, symbolizing the entrance to the Underworld.